You don't have to succumb. Burnout is a state of mental and physical exhaustion that can zap the joy out of your career, friendships, and family interactions. Continual exposure to stressful situations, like caring for an ill family member, working long hours, or witnessing upsetting news related to politics and school safety can lead to this stress condition. Burnout, however, isn’t always easy to spot. With that in mind, we’ve put together a guide to help you identify the signs of burnout, as well as ways to prevent it. Interested in helping friends, family members, or co-workers who may be experiencing this stressful state? We’ve also included a list of our favorite burnout intervention tips and tricks. 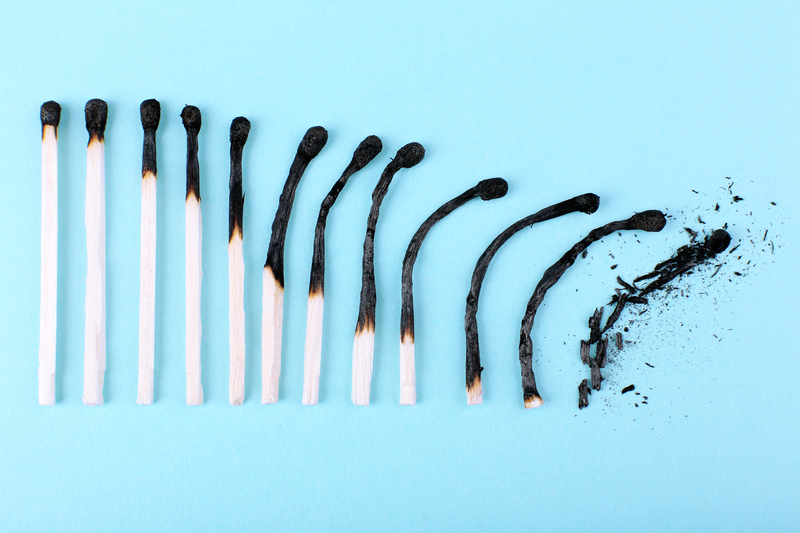 Coined by the psychologist, Herbert Freudenberger in the 1970s, burnout describes a severe stress condition that leads to severe physical, mental, and emotional exhaustion. Much worse than ordinary fatigue, burnout makes it challenging for people to cope with stressand handle day-to-day responsibilities. People experiencing burnout often feel like they have nothing left to give and may dread getting out of bed each morning. They may even adopt a pessimistic outlook toward life and feel hopeless. Burnout doesn’t go away on its own and, if left untreated, it can lead to serious physical and psychological illnesses like depression, heart disease, and diabetes. Anyone who’s continually exposed to high levels of stress can experience burnout. Helping professionals, such as first responders, doctors, and nurses are especially vulnerable to this health condition. Along with career-induced burnout, people caring for children can also have this type of extreme exhaustion. A recent study found that, just like doctors and business executives, mothers and fathers can also burn out. Personality characteristics like needing to be in control, perfectionism, and being “Type A” can also increase your risk of burnout. What are signs of burnout? Worried that you may be experiencing burnout but unsure of the signs? We’ve compiled a list of symptoms that you can use as a guide. Exhaustion. Feeling physically and emotionally depleted. Physical symptoms may include headaches, stomachaches, and appetite or sleeping changes. Isolation. People with burnout tend to feel overwhelmed. As a result, they may stop socializing and confiding in friends, family members, and co-workers. Escape fantasies. Dissatisfied with the never-ending demands of their jobs, people with burnout may fantasize about running away or going on a solo-vacation. In extreme cases, they may turn to drugs, alcohol, or food as a way to numb their emotional pain. Irritability. Burnout can cause people to lose their cool with friends, co-workers, and family members more easily. Coping with normal stressors like preparing for a work meeting, driving kids to school, and tending to household tasks also may start to feel insurmountable, especially when things don’t go as planned. Frequent illnesses. Burnout, like other long-term stress, can lower your immune system, making you more susceptible to colds, the flu, and insomnia. Burnout can also lead to mental health concerns like depression and anxiety. Unlike a cold or the flu, burnout doesn’t hit all at once. Excessive drive/ambition. Common for people starting a new job or undertaking a novel task, too much ambition can lead to burnout. Pushing yourself to work harder. Ambition pushes you to work harder. Neglecting your own needs. You begin to sacrifice self-care like sleep, exercise, and eating well. Displacement of conflict. Instead of acknowledging that you’re pushing yourself to the max, you blame your boss, the demands of your job, or colleagues for your troubles. No time for nonwork-related needs. You begin to withdraw from family and friends. Social invitations to parties, movies, and dinner dates start to feel burdensome, instead of enjoyable. Denial. Impatience with those around you mounts. Instead of taking responsibility for your behaviors, you blame others, seeing them as incompetent, lazy, and overbearing. Withdrawal. You begin to withdraw from family and friends. Social invitations to parties, movies, and dinner dates start to feel burdensome, instead of enjoyable. Behavioral changes. Those on the road to burnout may become more aggressive and snap at loved ones for no reason. Depersonalization. Feeling detached from your life and your ability to control your life. Inner emptiness or anxiety. Feeling empty or anxious. You may turn to thrill seeking behaviors to cope with this emotion, such as substance use, gambling, or overeating. Depression. Life loses its meaning and you begin to feel hopeless. Mental or physical collapse. This can impact your ability to cope. Mental health or medical attention may be necessary. Not only is exercise good for our physical health, but it can also give us an emotional boost. Stretched for time? You don’t need to spend hours at the gym to reap these benefits. Mini-workouts and short walks are convenient ways to make exercise a daily habit. Eating a healthy diet filled with omega-3 fatty acids can be a natural antidepressant. Adding foods rich in omega-3s like flaxseed oil, walnuts, and fish may help give your mood a boost. Our bodies need time to rest and reset, which is why healthy sleep habits are essential for our well-being. According to the National Sleep Foundation, avoiding caffeine before bedtime, establishing a relaxing bedtime ritual, and banning smartphones from the bedroom can help promote sound sleep hygiene. During stressful times, it’s important to reach out for help. If asking for assistance feels difficult, consider developing a self-care “check-in” with close friends and family members so that you can take care of each other during trying times. How can you help someone experiencing burnout? While you can’t take away someone’s stress, offering support can help lighten their emotional load. Before jumping into “fixing” mode, offer to listen to your friend or family member’s difficulties. Having someone to talk to can make a world of difference. Often people need someone to witness their stress and suffering, and listening can go a long way. When friends and family members are feeling the effects of burnout, saying It doesn’t sound that bad or I’m sure things will get better — while meant to offer reassurance — can feel invalidating if someone is really feeling low and hopeless. Individuals who are burnt out are often too tired to think of ways that others can help them. Instead of asking, “How can I help?” offer to drop off a meal, pick up dry cleaning, or do a load of laundry. Sending flowers, a thoughtful text message, or a written card can remind friends and family members that they’re not alone. Because they’re often working long hours, people with burnout can feel lonely and underappreciated. But small gestures of kindness can be nurturing. If friends or family members need additional support, like childcare, a house cleaner, or a psychotherapist, offer to research and crowdsource for specific resources to help ease the stress. Being exposed to continual stress can cause us to burnout. Feelings of exhaustion, anxiety, and isolating from friends and family members can be some of the signs. However, eating a balanced diet, regular exercise, and getting a good night’s sleep may prevent this stressed state. Worried about friends and family members who may be burnt out? Listening to their concerns, validating their emotions, and offering specific types of support can help lighten the load. Burnout can be avoided by making self-care part of your daily routine. Even if you’re working long hours, studying for exams, or taking care of young children, remember to sprinkle some joy into each day. Try going for a walk, talking to a friend, or watching an enjoyable program on television. Small self-care gestures like these can stop stress from turning into something more serious, like burnout.